In 2013, I wrote a book called The Art of Ritual and in it discussed what I felt to be important touch points of effective ritual design. Recently, Ár nDraíocht Féin requested that I teach a workshop on Effective Ritual Construction in their hospitality suite at Pantheacon 2017. Even though Eric and I routinely host rituals and teach ritual construction to our students, hosting a discussion with the Druids prompted me to revisit my book and the primary subject as well. 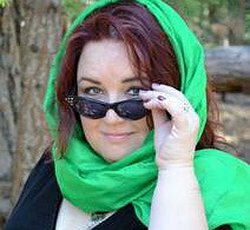 I was surprised at how “Wiccany” my advice was in that book, especially considering that I am not now Wiccan and was not when I wrote the book. I worked as a Wiccan High Priestess for around fifteen years and this was formative to my progression, so it found its way into my previous writing. What you read in this article is my revised and updated take on effective ritual construction. The Art of Ritual is a fine teaching tool…provided you are Wiccan. 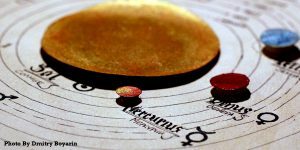 The perspective in this article has a broader scope and is more easily inclusive for other groups as well as for Wiccans. One of the most important considerations when you decide to create a ritual is to think about the purpose of the ritual and give it voice. We can go into ritual simply to commune with the Gods, give thanks, practice divination, or venerate, but we should name it as such. This tells our Higher Self our purpose for what we are about to do and gives direction to the people, if any, who will participate in the ritual with us. Ideally, you will emerge from the ritual altered in some way. Nearly all rituals are working practices and as a magical endeavor, we should seek to create change and therefore, come out of the ritual improved in some way from how we went into it. This is true for each person in your working group. When I first wrote the book Energy Magic, I realized I needed to define magic for the purposes of the book, much as we have to define our purpose in ritual. If I were to teach people how to move energy in a way that creates magic, they need to know what I perceive that magic to be. What I came up with was: Make A Generative and Interesting Change (MAGIC). Given that your purpose in magic is to create some sort of change, it should be both generative and it should also be interesting…otherwise, why bother? Your Gods: Whatever form your deity takes, ritual should be pleasing to them and honor them in some fashion. Groups and individuals foster different relationships with their Gods and the ritual you create should reflect the relationship you wish to sustain and evolve with your Higher Powers, whatever form they may take. Your Group: If you involve others, it is important that they remain engaged, feel like a vital part of the process, and take away from the ritual the energy of your intended goal. Yourself: As leader or as the sole participant, when you construct and enact a ritual, you must receive fulfillment from it or else energy flow is diminished to the other two points of accountability. You pull up the energy within yourself and push it out to the group and the Gods, then receive back from both, ideally creating a strong river of give and take that builds and intensifies throughout the ritual. This is the force through which the change you wish to manifest with the ritual is created. If you “aren’t feeling it” or your personal energy does not resonate with the ritual you created, your participation in that energy flow is compromised, which cripples the ritual impact. If you create an effective ritual that establishes a spiritual connection for you and the other participants, the God energy that flows is compounded accordingly. Ideally, your ritual serves each of the three “masters” effectively and your energy level grows throughout the ritual. In addition to the stated goal of the ritual, the effective union of this triadic energy function is primary to creating a strong ritual and, in fact, to making a generative and interesting change. Know your group: If you are working with others in the ritual, you must know and understand their needs and their expectations of the ritual. You would not present a ritual focused on growth and new development at a Samhain ceremony because there is an expectation that a Samhain ritual involves endings and ancestor veneration. It is fine and even desirable to sometimes mix things up and provide a new perspective to a theme, but if you know your group expects a certain type of ritual or key element, acknowledge that expectation and create an effective segue so you do not leave them wondering what is going on (or worse, if you got it wrong, which diminishes their participation on an energetic level because they lose faith in you). Know your material: Little is more distracting to ritual effectiveness than seeing leaders hold a script to their faces and read from it. The implication is that the person reading is not sufficiently in tune with the ritual to carry it out on the energy alone and must have reading prompts. Reading from a script is far different from providing an outline so that each participant is on the same page (literally). An outline is usually essential, but if you find you must read every word of your ritual from a script, it shows you did not do your homework sufficiently to speak to the individual ritual components from the spirit rather than from the head. Review, review, and review. You do not have to memorize verbatim unless it is a chant, song, or poem that you must get right. In that case, reading is understood. If your outline says, “Offering to the West,” present your offering and know what energies of the West you wish to engage and why, then wing it. The result is much more authentic and visceral than if you sweat out a perfect “Ode to West” and read it during the ritual. Open to channel: Channeling from the spirit is an integral part of the previous section, as is faith in yourself. If you have a bullet point outline and your part of the ritual is “Discuss the energy of Summer Solstice,” do your homework so you know the key points you want to bring up, then open your heart and spirit to the powers that be and trust they will give you words. If you are moved to interject in an off script manner during ritual, do so, but in a way that is respectful of others involved (who may be speaking). No one loves a spotlight thief and you want to make sure everyone involved gets their time during the ritual. If you are moved to interject off script five or ten times during a ritual, evaluate whether it is your Gods or your ego talking to you. Remain flexible and adapt quickly: Anyone who has constructed and enacted rituals for any length of time knows that anything can and will happen. Weather changes, key ritual participants flake, memories lapse, and other interferences do happen. For the benefit of the overall ritual function, it is essential that Those In Charge roll with the challenges and quickly adapt. Problem solve on the fly and with great haste. Drama interjected into these snags creates dissension and scattered energy, which are the bane of successful ritual flow. Quietly, calmly, and effectively move forward, whether the speed bump comes up in mid-ritual or two minutes before. This one component is as much of a hallmark of a true ritual leader as the ability to write the words to script. Fully engage: Do not phone in your ritual involvement. Regardless of what distractions go on in your personal life, it is essential that you fully engage the ritual and everyone in it for that sacred time. You owe it to the people who took time from their day to come participate in your ceremony to be there, fully present. As much as the ability to write pretty words or adapt quickly to shifts and changes, the need to completely plug into the magical act and to others who are involved is a necessary part of group leadership. When we position ourselves to lead a ritual, we enter into a contract of service to the Gods and to others involved. For the time of the ritual, we agree to be an instrument of both the Gods and of the group to convey the intention and energy of the ritual. Thusly, if we allow ourselves to become distracted by outside factors, we fail in the fulfillment of that obligation. Remove ego from the process: The truth of the matter is that most people who lead ritual for others have at least some small modicum of ego involved in what they do. There will be times that we come away from a ritual that pulls off even better than we expect and think, “Wow, that was amazing.” There will be times that the God spirit fills us almost beyond containment and in our secret heart of hearts we think, “Damn, I was good that time.” Sure, in a perfect world, we would externalize from that sort of pride, but it is human, natural, and part of reality. I am not at all sure that we shouldn’t embrace it in those rare times when it comes. To work from a perspective of ego, however, choosing scenarios that allow us to dominate the spotlight and interjecting our own needs above the needs of the group or of the ritual itself is a violation of our contract with the trinity, whether you knew you signed off on that clause or not. Once you involve others in the process of producing or receiving the ritual, even the Gods, the ritual becomes as much theirs as it is yours. The Mind: In addition to meeting the expectation of the group regarding the purpose of the ritual and its enactment, you must keep them engaged on a mental level while the ritual proceeds. The very nature of ritual reciprocity is that the leaders provide a ritual that meets – or preferable exceeds – the expectations of the group and maintains their interest for the duration, which allows and encourages them to engage their own energies to further the energy flow of participation. Keep the ritual relevant to the stated purpose, but avoid predictability that makes it seem as though you are working by rote. “Reach, don’t preach.” The longer you keep your participants involved in listening to you orate about the beauty of spring, for instance, the greater your chance of losing their focus. Include interactive parts of the ritual that show your group that they are a vital part of the process. Create participants rather than observers. Don’t make them have to work to stay focused and to engaged in the ritual process. The Body: One of the most aggressive detractors to ritual focus is physical comfort. Some higher level people have the ability to make physical discomfort part of their spiritual process during ritual, but for most, as soon as pain or discomfort comes into play, they lose energetic focus. Consider any participants who have physical challenges and make sure their needs are accommodated. Avoid extended periods of standing. Anything beyond ninety minutes is excessive for most people. Make sure the area is safe for moving, especially if lighting is dim. Stepping in a hole or tripping on a root or table leg takes most people straight out of focus. Consider the weather or climate. If it is extremely cold or your participants are subject to sunburn or heat stroke, keep the ritual short. Make it easy for them to “hold the field” and fuel your ritual with intention and energy flow. The Spirit: No matter how enthusiastic you are about your wonderful ritual, have someone you trust look over your plan to make sure the purpose of the ritual is fully engaged and activated over the course of the ceremony. Ideally, you present the premise of the ritual at the beginning, build the participants to a strong energy flow at the peak, and then ease them back down into the mundane world again. Each of these transitions should proceed seamlessly and have a meaningful impact on the participants. Prepare, set up, consecrate, and bless the area. Consider all that the participants will see, smell, or hear and remove anything that may distract from the focus. This includes the cat box that is not cleaned, the telephone that makes noises, the piles of magazines in the corner, and so on. 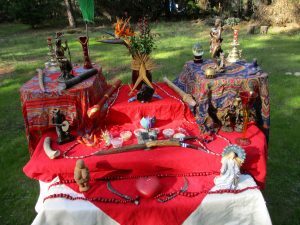 Your environment should make it easy for participants to remain focused on what happens inside the ritual area. Signal the beginning of the ritual clearly with an advance notice (“Ten minutes until ritual!”) and a clear definition to the beginning of ritual (a chime, bell, drum beat, etc.). Get their attention and let them know things are starting to happen. Regularly starting rituals at the stated time is a major part of establishing a beginning point. Establish group focus and group mind (Herding the Cats). You can do this through chanting, singing, processing, smudging, joining hands, a group visualization, circle casting, or any other practice that bonds the group together. Statement of purpose. Clearly present the purpose of your ritual: “To venerate the Gods,” “To celebrate the arrival of Spring,” “To give thanks for the harvest.” Everyone there lends energy to the purpose of that event and magical integrity demands that they know up front how that energy will be used by the ritual. No verbosity needed; just a simple statement of the purpose of the ritual. Connect to natural expressions of Divine energy. 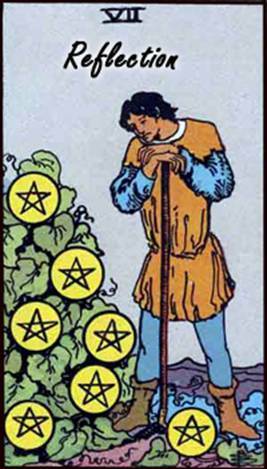 In some groups, the quarters are called or elemental energies are honored. Others recreate the cosmos or work with the compass directions or other specific natural forces. As humans, we use the natural expressions of God energy, often Earth, Air, Fire, and Water in some manner, as a gateway to connect to the Gods – using the knowable, formed, and familiar to engage the unknowable, subjective, and unformed forces of deity. Engage deities and kindred spirits. Invite any non-corporal energies you wish to engage in the way best suited to that entity. Welcome, acknowledge, and engage the energy, integrating it into the flow you created between yourself and the group. Include any workings pertinent to the ritual. This includes the building of energy, offerings, request for blessings, divination, and release of energy, as well as any in-ritual reflection on what has transpired and was received. Say “Thank you.” Be gracious. Give thanks to all deities, kindred, and humans who took time to engage your ritual. Make any announcements, such as the date and time of the next ritual, the progression of events following the ritual, and provide any guidance for exiting the ritual area. Close the rite. It is cumbersome to not know when it is safe to walk away from a ritual or what happens next. Alleviate the responsibility of your participants by making this information clear. It may seem this article is dedicated to group focus, however, you should always consider yourself with the same grace you extend to groups if you work solo. Sure, we can afford some short cuts when we act alone or only with our working partner, but the more we provide structure and procedure to our ritual work, the stronger the impact can be for us. It is called “ritual” for a reason and specific behaviors signal to our Higher Self that we have entered a place of concerted spiritual impact rather than merely an experiential process. There is a time and a place for experiential spirituality and it is important that we know going in which type of process we wish to engage.